Saturn is one of the most distinctive planets in the solar system, easily identified by its vivid ring system and colorful atmosphere. Saturn is a gas giant, consisting of a small, presumably rocky core surrounded by dense layers of gases that make up the bulk of the planet. If you were to venture into this atmosphere, you would find conditions unlike anything found on Earth. The biggest difference between Earth and Saturn are the gases that make up their atmospheres. Earth’s atmosphere consists of approximately 78 percent nitrogen and 21 percent oxygen, with other trace gases making up the difference. Saturn’s atmosphere, on the other hand, is approximately 96 percent hydrogen, with around 4 percent helium and other trace gases. Further toward the planet's core, however, scientists believe the percentage of helium increases substantially, forming as much as 25 percent of the planet's total makeup. Any living thing that evolved in Earth’s benign atmosphere would find Saturn’s volatile gaseous mix a lethal combination. 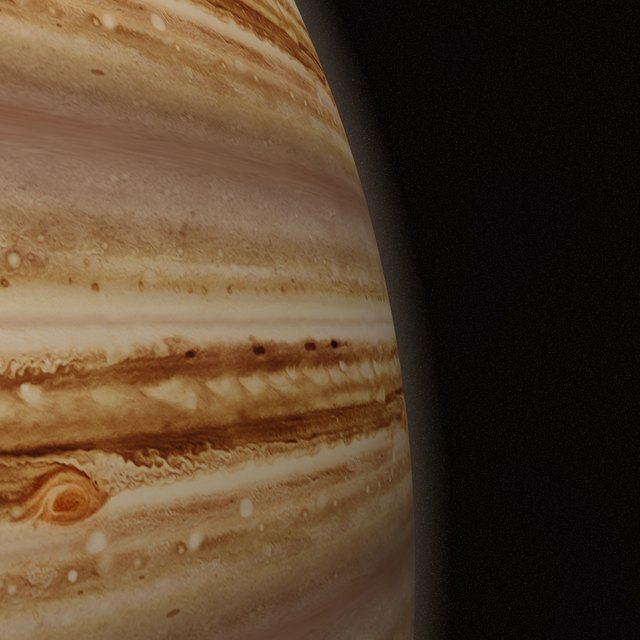 Another difference between the atmospheres of Saturn and Earth is the atmospheric pressure. Saturn’s radius is about nine times that of Earth’s, and all that gas produces high pressure as you descend into the atmosphere. NASA’s observations of the planet suggest that at its core, the pressure is more than 1,000 times that found on Earth, enough to force hydrogen first into its liquid state, and finally into a solid metal at the planet’s core. By comparison, the atmospheric pressure levels common on Earth exist only in the uppermost regions of Saturn’s atmosphere, where clouds of ammonia ice float in the frozen extremes. Saturn’s distance from the sun greatly affects the planet’s temperature. At the “one bar” level, or the level of the atmosphere equivalent to the pressure on Earth, Saturn’s temperature is -139 degrees Celsius (-218 degrees Fahrenheit). However, if you were to descend toward the dense core of the planet, the increasing atmospheric pressure would increase the temperature. The data collected from the Cassini-Huygens mission in 2004 suggests that temperatures might rise to as much as 80 degrees Celsius (176 degrees Fahrenheit) in the lowest reaches of the atmosphere, where pressures are highest. Saturn’s weather system is also unlike anything found on Earth. The colorful bands in its outer atmosphere result from intense straight-line winds that circle the planet, ranging as high as 895 miles per hour (1440 kilometers per hour) at the equator. In addition, observations of the planet have revealed massive storms deeper in the atmosphere, disturbances that occasionally break through into the outer reaches, disturbing the tranquil, layered appearance of the planet. Some of these storms are enormous in size and last much longer than corresponding weather features on Earth. 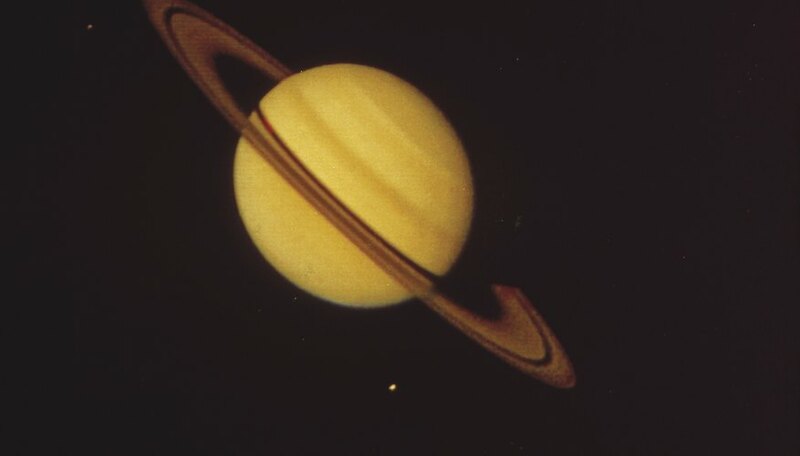 The Voyager probes, passing Saturn in 1980 and 1981, photographed an enormous hexagon-shaped storm, larger than the entire planet Earth, at Saturn’s north pole. When the Cassini-Huygens probe arrived in 2004, it discovered the same storm was still in progress, suggesting an extremely long-lived weather phenomenon. What Do the Larger Planets Have in Common? Kazmeyer, Milton. "How Does Saturn's Atmosphere Compare to Earth's?" Sciencing, https://sciencing.com/saturns-atmosphere-compare-earths-3547.html. 25 April 2017. Which Planet Is Considered Earth's Twin in Mass & Size?